Lafayette Hotel Mississippi Room located at 2223 El Cajon Blvd., SD. AFCDJS Members - $15, General Admission - $20, Under 30 - $8. The Mad Hat Hucksters was founded by swing dancer Morgan Day in 2015. Originally starting out as a jam band that played traditional jazz tunes of the 1920s, the band evolved to find their sound in the musical style of small combo jazz bands of the 1930s swing era. They have performed at many local San Diego venues, including the Firehouse Swing Dance, Tio Leo's, the Hep Spot, and Henry's Pub, and have been featured at the SD Jazz Fest every year since 2016. 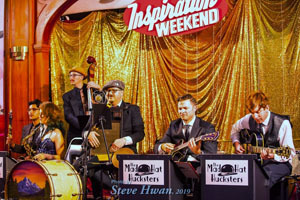 The Hucksters released two albums: "Swing and Jazz Music For Dancing" in 2017, and "Night of the Lindy Dead" in 2018, both of which can be found on Bandcamp, iTunes, Amazon, and Spotify. Their line-up includes Morgan Day, leader/washboard/drums/vocals; Lindy Edwards, tenor sax/ vocals; Nightshade Navarro, clarinet/soprano and alto sax; ; Anthony Marca, rhythm guitar; Michael Till, guitar; and Jeremy Eikam, bass.